After a rough winter with record-breaking low temperatures and snowfall amounts, homeowners across the Midwest are preparing for a potentially devastating 2014 Tornado Season. In 2013 many homeowners — especially those in Texas, Oklahoma, Kansas and Nebraska — became storm-weary as 943 tornados were reported throughout the United States. Some of those residents, like Julie McSweeney of Omaha, Neb., were fortunate to escape the loss of their homes, but ended up having to replace their roofs as a result of severe hail damage. One Omaha roofing company spending 16 hours a day, 7 days a week reroofing homes in the Omaha area last year was Weatherguard, Inc. Due to roof hail damage that left craters in roofs the size of tennis balls, the company installed more than 100 DaVinci synthetic slate and shake roofs in 2013 after storms careened through the city. 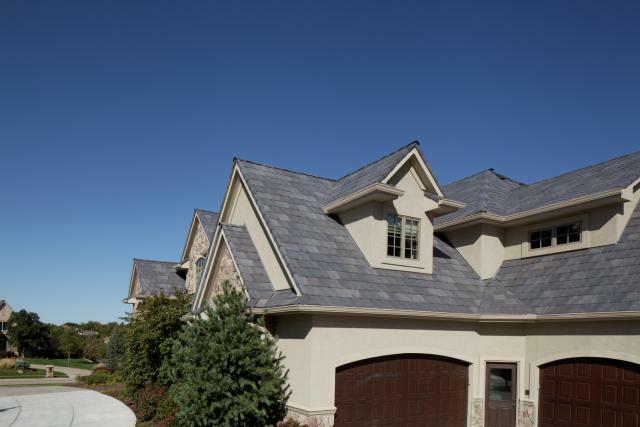 The family-owned business recommends homeowners across the country evaluate their roofs before the start of the next wicked weather season this spring. “Look for blown shingles or leaks, granules coming off or curling,” says Lovewell. “These are signs your current roof is in trouble. If you find these indicators, make sure to contact a qualified roofer now to help protect your home and family from bad weather conditions associated with tornados. See also All Hail DaVinci Roofing Tiles! and Featured Project – Residential Job – Omaha, NE.